A strong advocate for the importance of elementary art education for over three decades, Tracy Williams Cheney aims for total engagement of the heart, mind, and body. Through art, Tracy practices a key 21st century education tenet: Provide ample opportunities for students to make original, creative choices. Tracy has a BFA from Otis College of Art and Design, and a Masters in School Administration. Among her personal creative endeavors, Tracy produced an award-winning public radio show on educational issues called Making the Grade. She is the author and illustrator of numerous books and articles, participated in numerous art shows, and created artwork on display in public and private spaces. 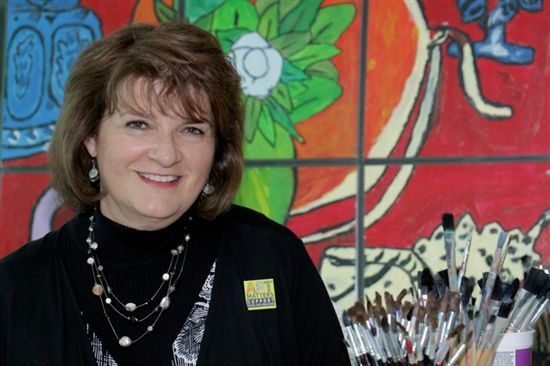 The California Art Education Association named her Outstanding Elementary Visual Art Educator for 2013, she was a 2015 nominee for Teacher of the Year, Encino Chamber of Commerce, and received an Exemplary Visual Arts Program Award for Use of Gifted and Talented, Integration, and Sequential Programming in 2015. But it is not awards and recognition that drive or characterize Tracy. It is her passion to find and unlock the creative thinking within every Berkeley Hall student while developing their skills to work with the visual language. Students are equipped to participate in the vibrant creative economy that fuels Los Angeles – where creative problem-solving and innovation will play a key role in their jobs of the future. 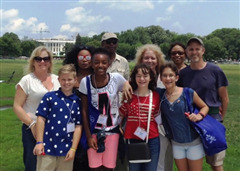 Four Berkeley Hall students were selected to represent CA at the 5th Arts Olympiad held this summer in Washington D.C. in front of the White House, where winners representing 33 states and dozens of countries from around the world met to celebrate the importance of the arts to the development of children ages 8-12. Art teacher Tracy Cheney accompanied the four BHS students and their parents for a this most memorable trip. The CA delegation was Kaelan B. ( 5th grade), Ashtyn W., Emily L., and Nadia M. (all 6th grade). Mrs. Cheney said, "We had a blast seeing historic sites and dancing on The Ellipse under the Washington Monument – and getting rained on every day!" Mrs. Cheney was asked to submit an article for the international magazine sponsored by One Child Foundation. Please enjoy the article and a movie by clicking on the headline. It was the morning immediately following the Art Awards Assembly. Eleven contests had been entered, announcements of winners made, and the certificates handed out on the Hodges stage. Then a phone call came into the art room from Washington, D.C. "There's one more important event that happens only once every four years, and we want some California students to enter," invited the pleasant voice from Washington, D.C.
"Oh, my students are just about out of school for the year. And we're tired," replied Mrs. Cheney. "No, we're not!" exclaimed a group of kids who happened to be working on various projects at recess. "We love entering contests. Tell us what it is!" they begged. "It's a huge task with a very tight deadline," said Mrs. Cheney, looking like she needed a good long nap. "We love it!" yelled the art bunch, and started whipping out sketches that very minute.